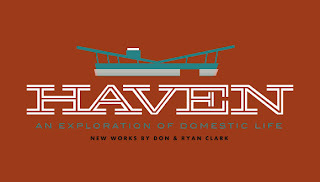 Ryan and I are happy to announce our first gallery showing: Haven. Wonderful Union is proud to present “Haven” by Invisible Creature. Brothers Don and Ryan Clark’s artwork highlights the tension between modernism’s smiley-faced rejection of things past and their own coming of age domesticity from an autodidactic, punk ethos point of view. Brothers Don and Ryan Clark are an eclectic duo. To spend any amount of time around their Queen Anne design firm, Invisible Creature is to know they’re serious pop culture aficionados. Their shop is filled with collectible toys, books, magazines and furniture. The unifying theme of these collections is a love for all things mid-century. Contemporary usage of the word bourgeois as expletive aside, there’s no arguing the average amount of time Americans spend amidst domestic accoutrements. And though the aforementioned clean-lined design motif hasn’t quite delivered the optimistic world of its promises, there’s still something Zen-like about the sprawling ranch house that fills the American consciousness. The Clarks’ pieces are inspired by their love of mid century architecture and their collectible fetishisms. The Clark bros founded Invisible Creature about a year ago after branching off from the celebrated design firm, Asterik Studio. With three “Best Recording Package” Grammy nominations under their collective belts and a client base ranging from Foo Fighters, Nordstrom and Nickelodeon, one would be hard pressed to find any designer in the know unaware of the Clarks’ towering presence. IC’s works have been published in over twenty books and they’ve been featured in HOW, Communication Arts, Print, STEP, and Computer Arts. They also play together in their “career side-project” metal band Demon Hunter. The band appeared on the cover of Revolver Magazine, hosted MTV’s Headbanger’s Ball and has sold nearly 300,000 albums. Special thanks to our bro Matt Johnson for delivering the good words.